↑ Haim Gordon. "Naguib Mahfouz's Egypt: Existential Themes in His Writings"(inactive 2017-08-13). Archived from the original on 2007-09-27. Retrieved 2007-04-26. ↑ Rasheed El-Enany (25 June 1993)Psychology Press.Naguib Mahfouz: The Pursuit of Meaning ISBN 978-0-415-07395-0. Retrieved 25 September 2012. ↑ Charlotte El Shabrawy (Summer 1992). "Naguib Mahfouz, The Art of Fiction No. 129". The Paris Review. Retrieved September 25, 2012. ↑ Tore Frängsmyr; Sture Allén (1993). Nobel Lectures: Literature, 1981-1990. World Scientific. p. 121. ISBN 978-981-02-1177-6. Retrieved 26 September 2012. ↑ "The Novel~Tea Book Club discussion". GoodReads. Retrieved 24 October 2013. 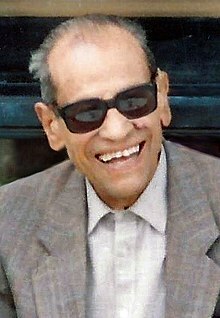 ↑ "Naguib Mahfouz (1911–2006)". The American University in Cairo Press. AUC Press. Retrieved 26 October 2013.